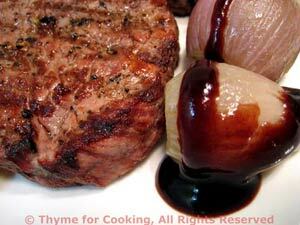 Steak, Roasted Garlic and Red Wine, easy gourmet from Thyme for Cooking. In the summer cook these quickly on the barbecue; in winter, quickly sear in a hot skillet. Either way, do it at the last minute so they don't get too well done. The roasted garlic and shallots are creamy and mild; the wine reduction rich and silky. Put 6 whole, peeled shallots and 6 whole, unpeeled garlic cloves into the center of a square of foil. Sprinkle with 1 tsp thyme and drizzle with 1 tbs olive oil. Bring edges of the foil together to make a package and fold together. Place package on a baking sheet with a rim and place in 400F (200C) oven for 30 minutes. After 30 minutes open package and roast for 30 minutes longer. Or: Place package over indirect heat on barbecue grill for 45 minutes, shaking and moving 2 or 3 times. Roughly chop remaining 2 shallots. Put shallots, remaining 2 cloves of garlic, bay leaves and wine in small saucepan. Boil until reduced by half. Add beef stock, vinegar, and reduce by half again. You should have 3/4 cup of sauce or less. Strain sauce and return to pan. Bring sauce back to a simmer. Dissolve cornstarch in beef stock. Slowly stir into sauce until thickened and clear. Keep warm. Brush steaks with remaining olive oil. Heat a large skillet over medium-high heat. Add steaks and cook, 3 - 5 minutes per side. If you like rare, remove after three minutes per side, make a small slit in one and check. If not done to your liking return for another 1 - 2 minutes per side. Remove from heat. Or: Cook on the barbecue grill for roughly the same amount of time. Place steaks on small platter or individual plates. Remove garlic and shallots from oven and package and arrange around steaks. Spoon some sauce over each and serve, remaining sauce on the side.